Annemarie “Mimi” Gratzinger Levitt, an iconic patron of the arts and historic preservation, died of natural causes on January 6, 2019 at her home in New York. She was 97. Known for her intelligence, grace and hands-on approach to philanthropy and activism, Mimi believed in the arts as a source for positive social change and left a lasting legacy of generosity and service to the causes she supported. Born in Vienna, Austria, Mimi’s childhood was filled with opera and other musical experiences. 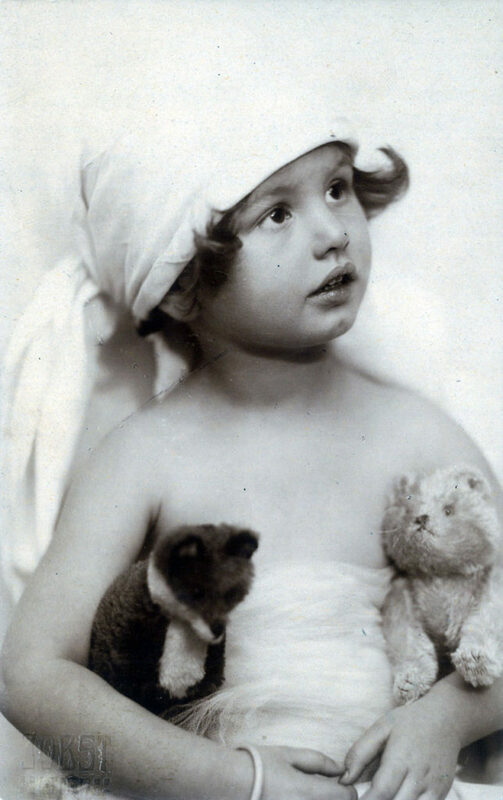 She emigrated to the United States with her mother at the outbreak of World War II, and soon after attended Pomona College in California, where she graduated Phi Beta Kappa with a degree in French Literature. A linguist fluent in five languages, she was one of the translators at the Nuremberg trials in the late 1940s. In 1947, Mimi accepted a position as senior assistant to Alfred Barr, Jr., the first director of the Museum of Modern Art in New York. She met rags-to-riches clothier and The Custom Shop founder Mortimer Levitt (1907-2005) at a Manhattan art gallery opening, where they had a spirited debate over a painting (Mimi favored abstraction; Mortimer preferred realism). 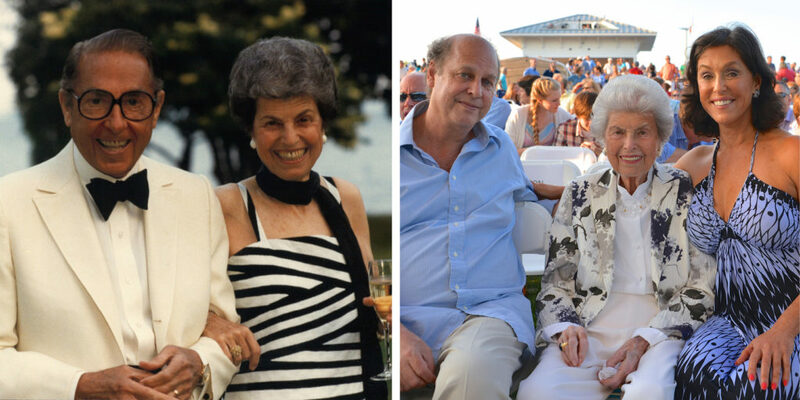 Following a brief courtship, they married on June 18, 1948, and together became philanthropists supporting youth music programs, performing arts organizations and educational institutions. 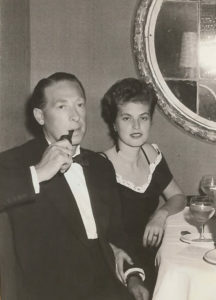 Mimi and Mortimer were known for promoting aspiring young musicians by hosting salons at their Manhattan brownstone. 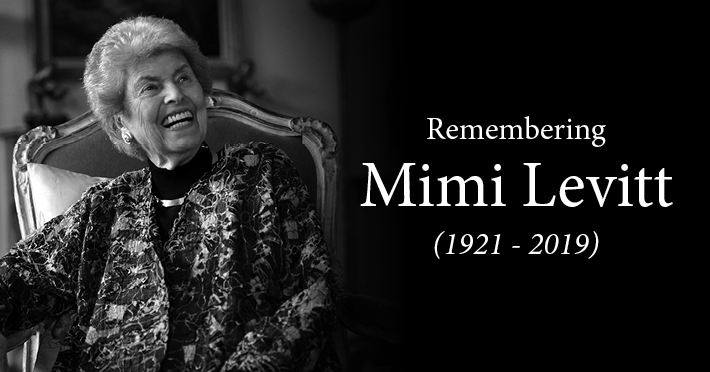 An imaginative and meticulous hostess, Mimi was also known to throw memorable charity events and family celebrations, and she often opened the Levitt family home to artists and musicians. 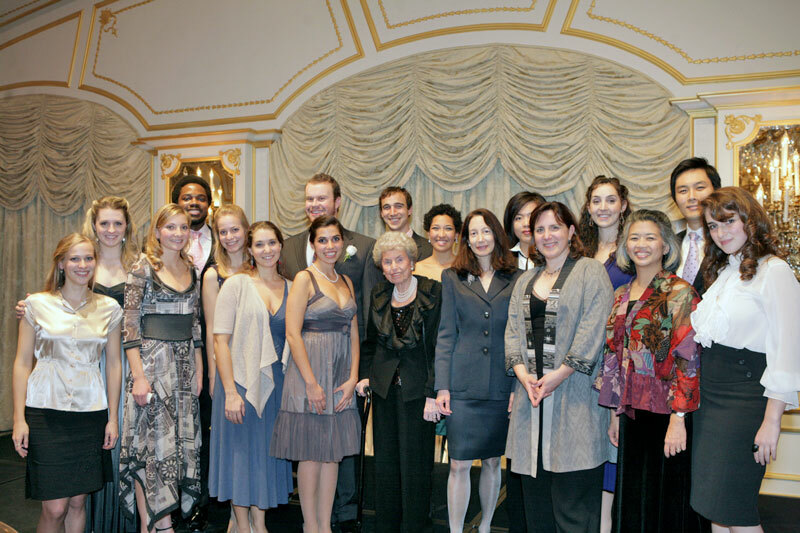 An active and loyal benefactor of the Bard Music Festival, Mimi served on the board of directors for 15 years (1998-2013), and for many years underwrote the Festival’s annual opening night dinner. An avid lover of opera, she supported opera workshops in the Conservatory’s Vocal Arts Program directed by Dawn Upshaw and helped commission one act operas. She also funded scholarships for Conservatory students and started the first endowment for the Bard Music Festival in 2005. In 2006, Mimi received the Charles Flint Kellogg Award in Arts and Letters in recognition for her longstanding support of the Festival. Mimi was also passionately committed to historic preservation; in the 1970s she spearheaded the Neighborhood Association to Preserve Fifth Avenue Houses that successfully championed the creation of the Metropolitan Museum Historic District in New York City, designated in 1977. Her involvement grew from concern about protecting the distinctive character of her Upper East Side neighborhood, which in the 1970s was undergoing significant change. Mimi also served on the board of the Friends of the Upper East Side Historic District. She was one of the earliest supporters of the New York Landmarks Conservancy, and served on its board from 1978-2014. 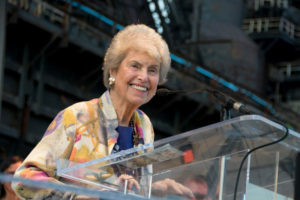 In addition to being a generous patron to the Conservancy’s endowment and annual Living Landmarks gala, Mimi was an effective fundraiser connecting people to the cause. As a Conservancy board member she wrote a poem dedicated to famed architect and then board chair John Belle, which was read at his memorial service. Mimi was honored by the Conservancy in 2011 for her 30 years of service. In 1995, Mimi and her husband donated 564 acres of wildlife habitat near Half Moon Bay to the Peninsula Open Space Trust in Marin County, California – the second-largest gift in the county’s history – providing an invaluable boost to ecological conservation efforts dedicated to preserving the beauty and character of the region’s natural resources. 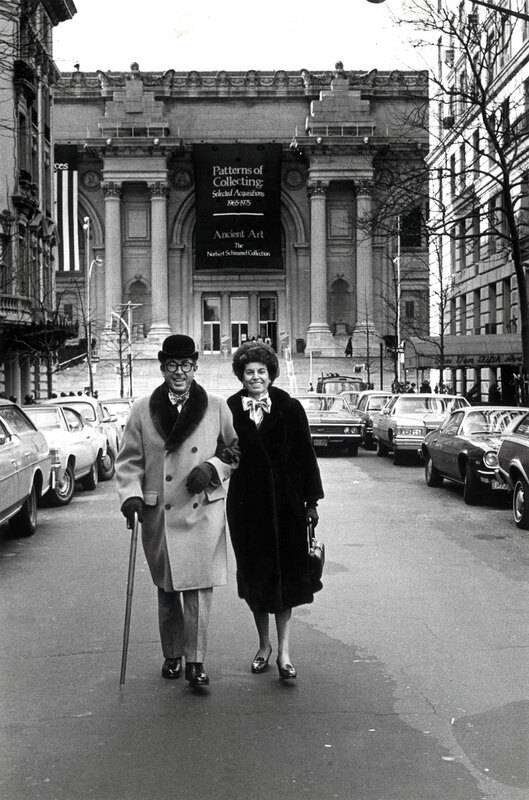 Together with Mortimer, Mimi also supported the Metropolitan Opera, Lincoln Center for the Performing Arts, Mercy College, Museum of Television and Radio, New York City Opera, The Metropolitan Museum of Art, Central Park Conservancy, The Joyce Theater, New Victory Theater, Lincoln Center’s Film Society, Hunter College, Music Center of Los Angeles, School of American Ballet, American Red Cross, and Young Concert Artists. She was a member of the Mayor’s Commission on Drug Addiction under Mayor Koch, a former trustee of the Town School in Manhattan and the Branch Libraries of the New York Public Library. She also was a children’s literacy volunteer in Harlem. A beloved mother, aunt, step-grandmother and step-great-grandmother, Mimi cherished her family and the time they spent together. She is survived by her daughter, Elizabeth “Liz” Levitt Hirsch of Los Angeles who now serves as board president of the Mortimer & Mimi Levitt Foundation, and her son, Peter Levitt of New York who also serves on the Levitt Foundation board. There will be a private funeral followed by a public memorial service that will take place at a later date. For details regarding the public memorial, please email memorial@levitt.org. In lieu of flowers, donations in honor of Mimi may be made to the Mortimer & Mimi Levitt Foundation. This entry was posted in News and tagged Mimi Levitt on January 6, 2019 by Vanessa Silberman. We are so grateful for this visionary lady who understood the power of Art and showed how individuals can truly make a huge impact. We are praying your strength and comfort during your time of bereavement. We speak her name in our prayers and thank God for her life and legacy. I join in celebrating her life dedication to the arts, to historic preservation, to the preservation of natural habitat, her dedication to her family. The wise and generous legacy of Mimi Levitt will continue to enrich lives as well institutions for present and future generations . It was a privilege,and an inspiring gift to know her just briefly. I send heartfelt sympathy to the Levitt family . You smile, grace and elegance will always be in my heart. The way you welcomed me into your home and gave me advice while starting my career will always be remembered. You were an inspiration to me, and will be missed. My heartfelt condolences to Liz and Peter. I am deeply saddened that Mimi Levitt is no longer with us to share her vision and her humanity. It is an honor to have known her and to have heard her incredible story, a truly great American story. Mimi leaves a legacy of changed communities and changed lives, a legacy that will live on for generations to come. Thank you. With deepest respect and sympathy for the entire Levitt family. We were introduced to the deeply arresting weekly dinners at the Levitt household though mutual friend, Bill Bernbach, one of America’s most gifted advertising men (“You don’t have to be Jewish to enjoy Levi’s Rye Bread! )” acclaimed an Asian fellow from a subway poster!!) Our Levitt friendship continued for decades! Mimi’s youthful work, translating at Nuremberg was an historic, singular accomplishment. At home in Manhattan, Mimi’s attention inspired effective preservation work in her very neighborhood. The Levitt’s wide fiscal support aided many classical musicians under the aegis of Young Concert Artists. The two underwrote my documentary “Great Berkshire Gardens,” enabling the film’s broadcasting on PBS-TV. Such friends are among life’s true blessings. prayers are with you! Sending my Love and Deepest Condolences to you and Family. What a grand lady & visionary, and thanks to love of the arts, she made it possible for many of us in Chattanooga, Tn. to have a wonderful time for many weeks to have free music to enjoy. Sending the family prayers & sympathy in the next coming days. The Levitt foundation has graced our city, enriched a small, local, emerging arts organization. Thanks and gratitude from Carson City to the generous spirit of the Levitt’s. What a beautiful life and a beautiful gift Mimi has given to us through her vision, dedication and passion. My deepest condolences to her family. In gratitude, we celebrate her gift through the Levitt AMP Ocala Music Series for a 3rd year. The visionary life work of Mimi Levitt will continue to be a well-spring of inspiration for the creative placemaking movement. Her legacy touches us deeply. My sincere condolences to her family and all who knew and loved her. What a beautiful life! Love our Carson City series of concerts and can’t thank this couple enough for supporting the arts. So sad to hear of Mimi’s passing. Levitt Amp Galva is just now in its second year with the Levitt Amp Grant and getting to know about the great organization, and the people (Mortimer & Mimi) who have touched so many lives. People like Mimi are not easily replaced. Our Sympathies to the family and those that knew her. My condolences for your profound loss. What an amazing woman! She certainly lived a full life and gave so much of herself to the arts and to preservation. No doubt she has been an inspiration to countless people.. You certainly take after her, Liz. How blessed are both of you to have had each other for so many years. I’m sitting here crying and didn’t know her. The Denver pavilion is a mile from my house and I couldn’t be more grateful. I suppose my sadness is she’s no longer with us, and I’ll never rise to her level. Mimi’s genius for creating communities around the art and music that she loved was a rare gift. Along with Mortimer she turned cultural passions into generous opportunities for both artists and audiences. Mimi’s Old World grace and wit lit up a room, and if you were among those who sat at her dining room table like family, you counted yourself lucky. Her passing leaves a vast hole in our lives, but it’s a space rich with experience shared over many years in company with this deft, insightful woman. It is so inspiring to read about this strong and loving woman’s life. Liz, thank you for sharing the abundant details of your amazing Mother’s life. For sure her legacy will not be forgotten. I also send much Peace and Serenity to You and all your family at this time of your Mother’s passing. Your own life’s accomplishments are already an inspiring extension of what your loving Mother began ! A magnificent life dedicated to the power of music and visual arts, to dance and theater, to beauty and familial love. Mimi was a tender friend to the Javits family. I loved her warm hugs, lively voice, probing questions and wondrous smile! I am deeply saddened by the loss of an amazing and beautiful lady…Mimi Levitt. I had the great honor and pleasure of spending time with her both in California and New York. I listened to her wonderful stories about her incredible life and I was truly inspired. I will miss her zest for life, love of music but I will miss her smile that could light up a room. Mimi will always be remembered and loved by all who met her. Beautiful Viv. Thank you for capturing her wonderful spirit. Thank you for sharing this. You are truly carrying forward your mother’s tradition of supporting the arts that serve our communities. Liz, Thank you for passing along this great story of lifelong service to others, AND to you for carrying her tradition forward. A great woman whose legacy lives on in her illustrious daughter, who is my good friend. She clearly had an indelible impact on the cultural institutions and causes she so generously supported. I am honored personally that she attended a talk I gave at the Museum of Modern Art where (I now learn) she was assistant to Alfred Barr in 1947. Our world is lucky to have had Mimi Levitt.